This is “The Storage and Shipping of Goods”, section 18.3 from the book Legal Aspects of Property, Estate Planning, and Insurance (v. 1.0). For details on it (including licensing), click here. A bill of ladingA document of title acknowledging receipt of goods by a carrier. is any document that evidences “the receipt of goods for shipment issued by a person engaged in the business of transporting or forwarding goods.”Uniform Commercial Code, Section 1-206(6). This is a comprehensive definition and includes documents used by contract carriers—that is, carriers who are not common carriers. 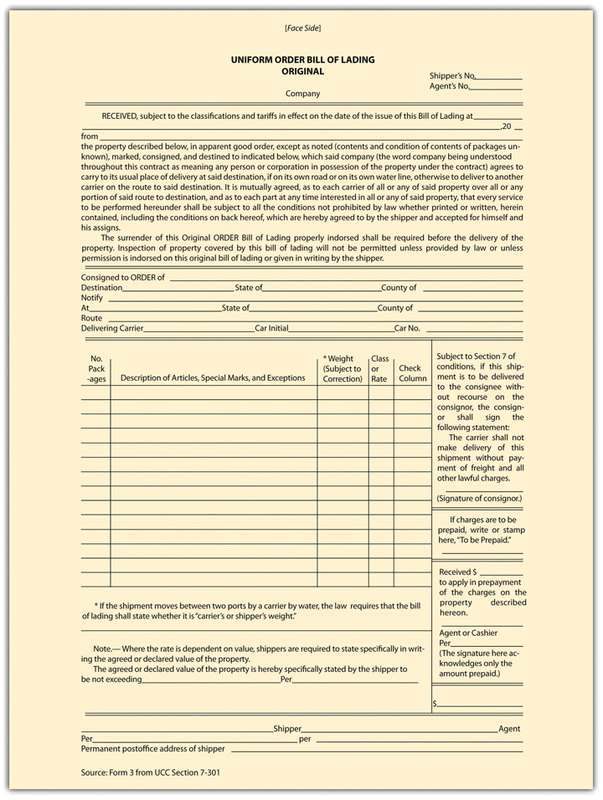 An example of a bill of lading is depicted in Figure 18.2 "A Bill of Lading Form". Damage, destruction, and loss are major hazards of transportation for which the carrier will be liable. Who will assert the claim against the carrier depends on who bears the risk of loss. The rules governing risk of loss determine whether the buyer or seller will be the plaintiff. But whoever is the plaintiff, the common carrier defendant faces absolute liability. With five exceptions explored two paragraphs on, the common carrier is an insurer of goods, and regardless of the cause of damage or loss—that is, whether or not the carrier was negligent—it must make the owner whole. This ancient common-law rule is codified in state law, in the federal Carmack Amendment, and in the UCC, Section 7-309(1), all of which hold the common carrier to absolute liability to the extent that the common law of the state had previously done so.